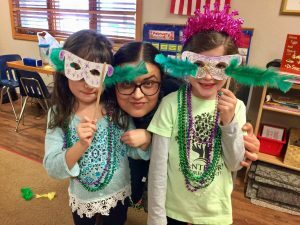 Celebration is an important component of the Montessori curriculum. 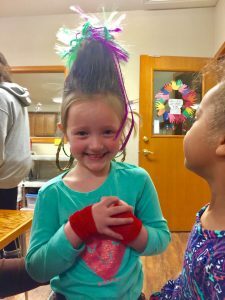 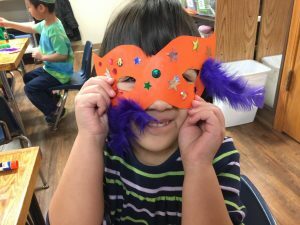 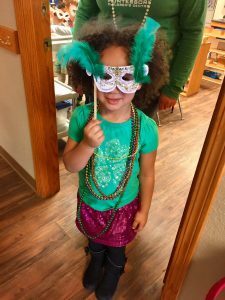 During the month of February at Montessori Children’s Centre we had a lot to celebrate, including Valentine’s Day, Mardi Gras, and Dr. Seuss’ birthday. 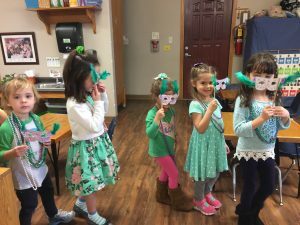 Celebrating is important to our preschool, plainly said because it gives our children so much joy. 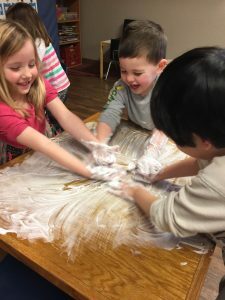 We know that when children are happy and joyful they are excited about learning. 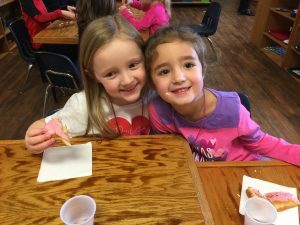 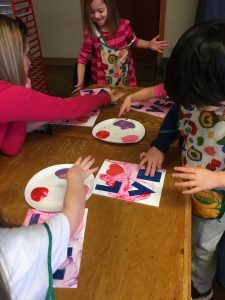 Our preschool relies on the wonderful parents of our students who volunteer two hours of their time to sign up for our holiday parties, such as our Valentine’s Day parties. 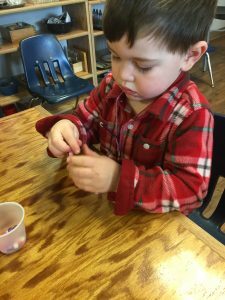 This Valentine’s Day we had some parents devote take time to bringing crafts, snacks, and activities and we are so grateful! 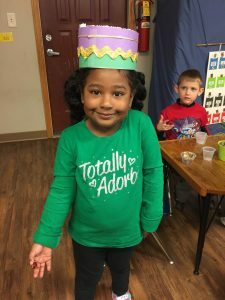 Thank you, parents! 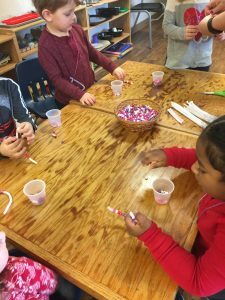 The children were able to create their valentine’s bags and boxes using fine-motor skills and creativity and thanks to our parents, the children had the opportunity to use their fine-motor skills to create the crafts during the parties. 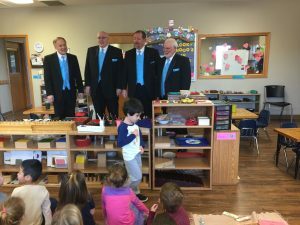 We also welcomed special guests, The Barbershop Quartet, who sang love songs to the children. 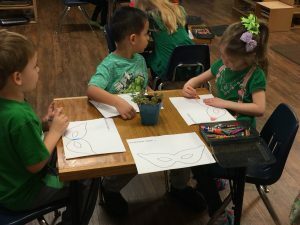 They were mesmerized! 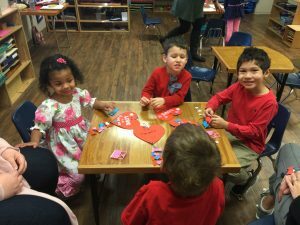 It was a truly special Valentine’s Day. 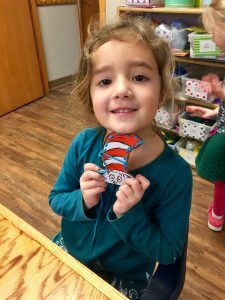 In celebration of Dr. Seuss’ birthday, this year we celebrated by hosting a “spirit week” – Monday we encouraged the children to wear crazy socks for (Fox in Socks), Tuesday we encouraged wearing green (Green Eggs and Ham), Wednesday was wacky Wednesday, Thursday we wore pajamas (I’m Not Getting Out of Bed Today! 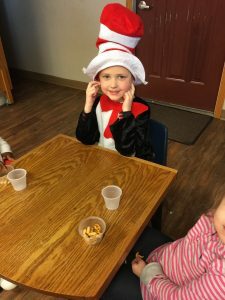 ), and Friday we wore hats and stripes (Cat in the Hat). 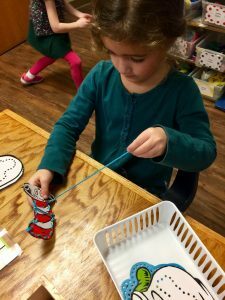 In addition to spirit week, we incorporated Dr. Seuss in our classrooms in different areas (Practical Life, Language, Sensorial, Culture/Science).